I would never understand why you are so daunted by fractions... :P What would we do without them?? It wasn't that difficult, was it? 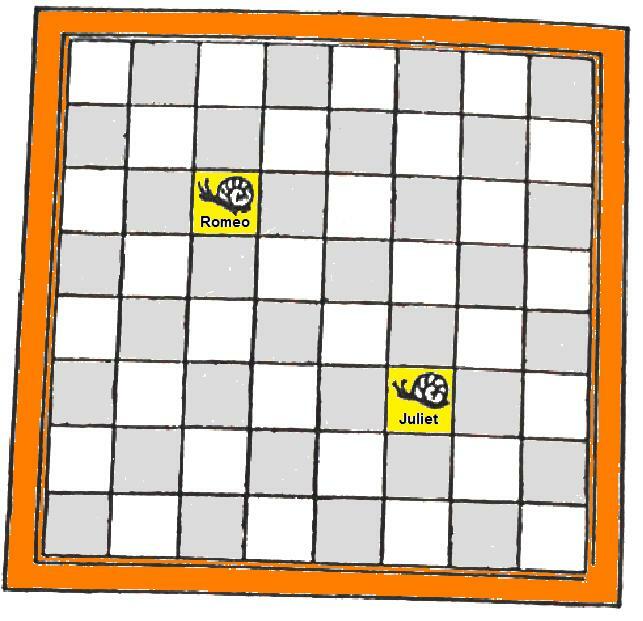 These two snails are Romeo and Juliet. Juliet has been waiting in her balcony for her lover‘s arrival, but Romeo has just had dinner and he has truly forgotten the number of Juliet’s house. 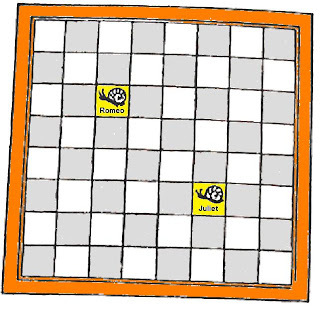 Every square represents one house (64 in all, including Romeo’s and Juliet’s) and the passionate lover will visit every single house one time and one time only before reaching to Juliet. You must try to help him to find his way but be careful… he is only allowed to move upwards, downwards, to the left, to the right and diagonally. The procedure is the same as always: send me an e-mail with the solution and post a comment to this entry. This challenge's deadline is October the 22th. Ony the first 10 valid solutions will get a positive!! Don't miss the chance! Tip: The best way to try to solve this is copying the image to gimp, paint or a similar software and draw the lines over it. formerly known as Victoria Adams??? I have sent you the answer. Mario i have solved the problem (not without some help) SERIOUSLY???? The SPICE GIRLS????????? I can just hear my Nanna:as common as muck. Take note of the perfect british posh accent i do not posses.